The original manuscript of Mary Shelley's Frankenstein is due to be saved for the UK after a £3m grant was awarded to a prestigious library. A draft of the horror classic completed in 1817 is now likely to be displayed alongside other Shelley papers at Oxford University's Bodleian library. The National Heritage Memorial Fund has stepped in to try to prevent the work being sold at auction and going abroad. 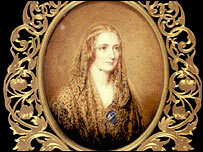 Shelley began writing her masterpiece while on holiday in Geneva in 1816. She had been accompanied by her husband, the romantic poet Percy Bysshe Shelley, their friend and fellow writer Lord Byron, and a doctor called Polidori. The idea for the book was inspired by late-night talk of ghost stories and a discussion on whether lightning could jolt a corpse back into life. 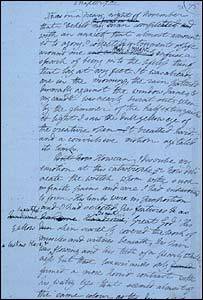 The manuscript contains many hand-written corrections by Percy Shelley. Academics say it provides unique evidence for the debate on how much he influenced the story. The memorial fund grant is towards the purchase of the Abinger Papers, an archive which also includes letters and papers from Mary Shelley's parents, the feminist writer Mary Wollstonecraft and intellectual William Godwin. It also contains correspondence from her husband, and Thomas Malthus, who inspired Charles Darwin. Although most of Shelley's papers are permanently housed at the Bodleian, the Abinger archive has only been there on loan since 1974 for the benefit of scholars. These papers - about a third of the entire Shelley collection - are now being offered for sale. The Bodleian had already collected £500,000, and now has until March 2004 to raise another £385,000 to reach the reserve price. Stephen Johnson, head of the National Heritage Memorial Fund, said: "Few things are more precious than the Shelleys' personal notes and Mary's autograph draft of Frankenstein."